Just hang your stockings on the fire place. You know that Santa's coming to town. I'm the one who wants to take you on a sleigh right now. 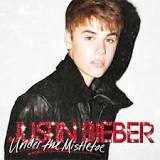 The mistletoe can pull us closer that's what I'm waiting for. It sorta feels like it's Valentine's, Valentine's. So I'm entering the top of your roof, them sleigh bells is ringing. I'll be up all night with you, them carols are singing. Japan to Peru, baby me and you, this Christmas eve! I don't need no presents girl, you're everything I need! To north pole, is that cold? I don't need no presents girl, you're everything I need. I promise I won't do you wrong!! Let me give you all of me to you!